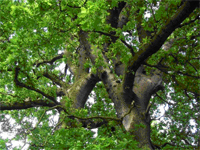 Citizen Science - What makes oak buds burst in spring? Once a small hamlet of narrow country lanes and farms, Earley has been transformed into a busy, residential area with little evidence remaining of its rural origins. What can be found, like skeletal remains, are mature trees, which once lined quiet country roads or were part of woodland belts. When you next pass down an old Earley road, look for trees, particularly oaks, which may silently line it. Sometimes they may be in an avenue, sometimes in a remnant of hedgerow or perhaps isolated and ending up beached in a street shrubbery or someone's garden. These may have been youngsters when your great-great-grandparents, were babes in arms. A few of them predate the oldest occupant of Earley by perhaps three hundred years, real old timers. These were trees that for some reason had been left or neglected to continue growing year by year. They are now hardly given a second glance by passers-by. But what if they could talk? Imagine all the thousands of living things they have provided over the years with shelter and food, the great storms they have weathered, the changes in history they have witnessed. We can ill afford to lose our trees which add much needed character, both from an historic and aesthetic point of view to the urban landscape, as well as providing invaluable habitats for wildlife communities. 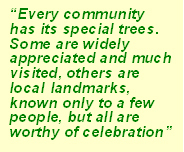 For information on notable trees in Earley, click on the menu to the right. The pdf icon at the bottom is a link to a document with all the infoirmation. If you have pictures, information or a story about a particular tree in your garden or street, please send details to the WebMaster using the contact link below. Thanks to Sheila Crowson for the details and pictures.